Speedy Market is pleased to announce the arrival of Nordic Waffles in our store! Originating in Norway and made locally In Minnesota, we cannot say enough good things about these waffles! You have got to try them! Thank you to everyone who stopped by the sampling we had on Tuesday! In Norway, waffles are everything. They can be sweet or savory, for breakfast or for dinner, with lingonberries, or sausage, and always enjoyed by all! That tradition has found its way to Minnesota, courtesy of Stine, and her company Nordic Waffles. Stine’s story starts in Norway, where she owned a gas station with a delicious, homemade twist: freshly prepared waffles; word spread and people were coming from all over to devour these tasty treats. The waffles were so good that she started another company to sell the waffles at gas stations all over Norway. The key to great waffles are great ingredients; that is why Stine is committed to only using the very best ingredients. There is nothing in these waffles she would not eat herself! She only uses the best flour and the freshest milk and butter to make each waffle the perfect canvas for culinary excellence! That commitment is right on the Nordic Waffles logo. When it comes to making waffles all day, standard waffle irons simply will not do; they may, in fact, break down completely. No iron could stand up to the wear and tear of all day waffle making, so Stine partnered with a Danish manufacturer to create the perfect waffle iron. Between the waffle recipe and the irons, Stine’s commitment to the perfect waffle is evident in every bite of every Nordic Waffle. With a thriving and successful business, most people would be content to call it a day and nurture it, but not Stine; she crossed the Atlantic and it bringing Norway’s love of waffles to America and to your favorite Speedy Market. It is a taste of Norway in your backyard! Much like Stine, Chef Alan also refuses to compromise and that’s why you will only find the best ingredients on Nordic Waffles at Speedy! The waffle itself is like a cross of a waffle and crepe; as with so many items, tasting is the only way of truly believing in the magic of waffles! The menu features 3 sweet and 3 savory options, as well as a rotating special! On the sweet side, be sure to check out the hazelnut-cocoa waffle, featuring Chef Alan’ made from scratch hazelnut-cocoa spread. 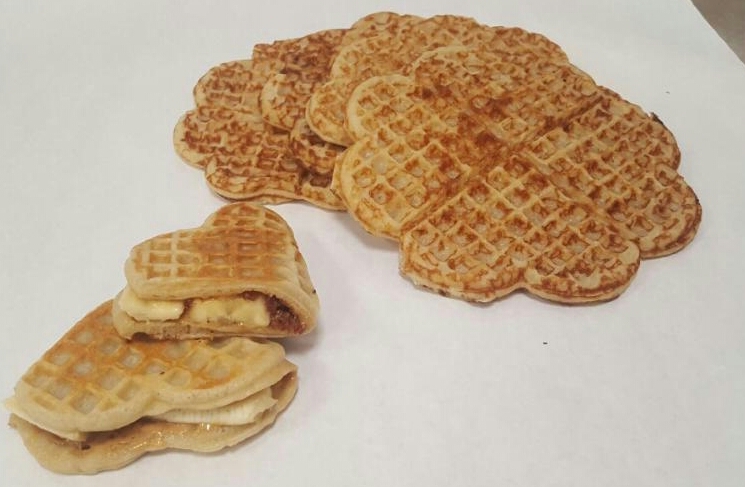 On the savory waffle, try the “Press”-ley, featuring peanut butter, banana, and Speedy bacon! There will also be a rotating special with a chef’s choice of ingredients! If a sweet waffle is more your style, be sure to check out the lingonberry and sour cream waffle, or the hazelnut-cocoa spread waffle, featuring a hazelnut-cocoa spread prepared freshly by Chef Alan using his own recipe! You can also bring Nordic Waffles home with you with our frozen 4-pack. Made fresh and then frozen at Speedy, this is a great way to be creative with Nordic Waffles at home!